did you get the plate number? 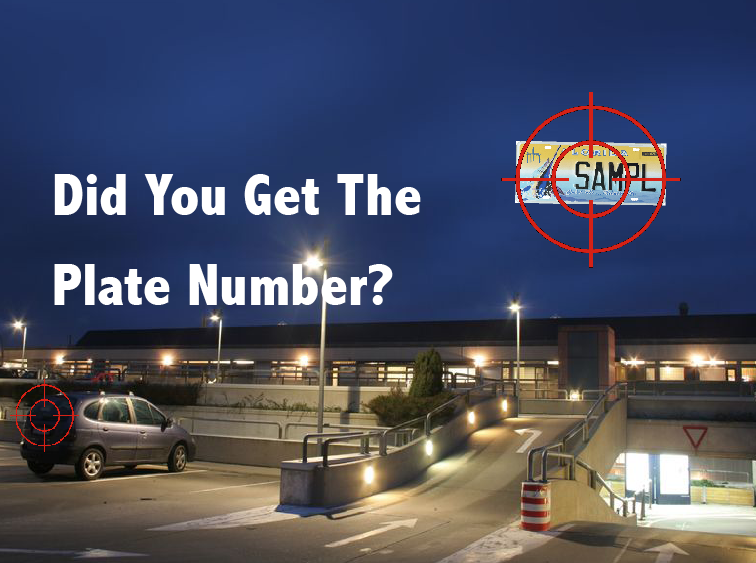 “Did you get the plate number?” is a common question asked during investigations of wrongful activity. And why not? The license plate number is often a telling identifier of an individual in these modern times and much of the activity we secure against is aided and abetted by vehicles. 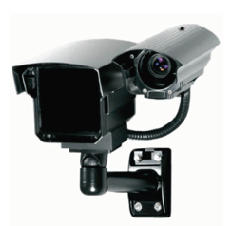 Two main objectives of surveillance video are to detect and document. Automatic license plate reading (ALPR) as a tool in surveillance technology has now matured to the point that it should be considered in most enterprise applications. In this article we will review the current availability of automatic license plate reading and how you might augment security with it. Automatic License Plate Reading (ALPR) technology (also known as ANPR) was invented in the UK in 1976 and prototypes emerged in 1979. The first arrest – for vehicle theft – was made in 1981. As technology matured license plate image capture became commercially viable in the 1990s. As we entered today’s century Extreme CCTV of the UK and Canada (later acquired by Bosch) was considered the leading supplier to commercial industry. 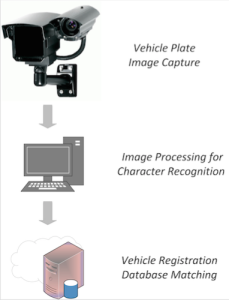 See the accompanying image (Figure 1) for a typical license plate reader. The remaining steps of number identification and database matching matured more recently. Today complete solutions are now broadly available. Here in the US you probably first encountered the technology at toll booths. This application was a single vehicle lane and required only slow speed plate captures. This is very easy compared to current applications. Today’s ALPR equipped police cruisers can capture license plate numbers of vehicles in ongoing, multiple lane traffic and provide immediate notification of any traffic or criminal record associated with the vehicle registration. What you may design for your site is somewhere in between in complexity. See the diagram entitled Main Steps of ALPR (Figure 2) for some of the key elements. What are the factors involved in reliable plate image capture? Lane target definition. The most cost effective camera lenses and geometric considerations can limit the target width to 10 to 12 feet. This generally can guarantee detection in only one lane. If one desires to expand target width then more expensive optics and higher definition sensors are required. General illumination concerns. Front or rear lights and sunlight reflection of the license plate can obscure image capture of the numbers. To lessen this an angle significant enough to avoid such reflection is introduced between the camera and target plane. Near infrared illumination and filtering is typically used to improve image capture in nighttime situations. Angle to target. As mentioned above, an angle is often introduced to avoid reflection of ambient light into the camera but the angle cannot be so severe as to inhibit image definition of the plate. In addition to these two factors, the physical angle of available structures to mount the camera on relative to the target as well as avoiding objects in the way will also define the successful configuration. Shutter speed and frame capture. If attempting to capture the plate image of a moving vehicle at speeds up to 60 miles per hour and more, the shutter speed ideally should be a millisecond or less and the frame rate 30 frames per second in order to obtain one or more reliable plate images for each vehicle traversal given all other factors (including depth of field). Accompanying scene photo. Depending on the situation you may be able to use the same camera for an image of the overall vehicle during daylight hours or rely on a second camera trained on the target area for this purpose. So license plate capture is much more than image resolution. Even when the above factors are well addressed, obscuration of the plate by snow or dirt, the occasional issue of overwhelming light reflection into the camera and non-technical factors such as cloned license plates can occur to thwart this technology. Despite this, the most well-designed systems can be found to be accurate well above 90% of the time. Find and isolate the plate on the picture. Compensate for the skew of the plate and adjust the dimensions to the required size. Adjust the brightness and contrast of the image. Find the individual characters on the plates. Convert these characters by optical character recognition. Check the characters and positions against country-specific rules for language and plate design. Average the recognized value over multiple images (if available). Realizing what is involved helps in the configuration of a system as well as gauging the value of an offering. 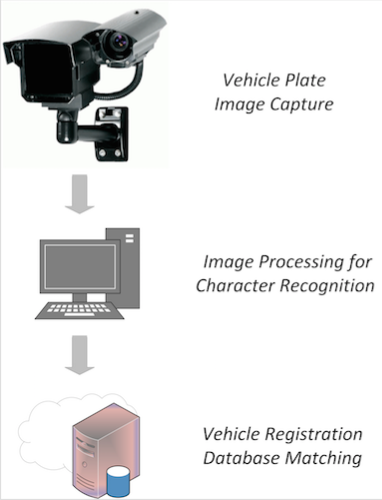 If you are a government agency authorized to access comprehensive vehicle registration databases, the image processed plate ID can be automatically matched with criminal and infraction data to yield the name of the vehicle owner and other information. What though, if you are a private entity? At a minimum you can still maintain a timestamped database of vehicle ID’s entering your property. This can be consulted as needed during an investigation. If you have employees and vendors register their vehicles you can then exclude them as vehicles of interest to yield a shorter list to review or be informed of. You can also match against a blacklist and be notified immediately of the approach of potential known dangers such as a disgruntled ex-employee and / or those under a restraining order to protect employees, etc. In some cases this data can be shared online with local law enforcement who can within their own discretion further search for information linked to the vehicle. One example would be large housing districts seeking to reduce crime. • The extent to which legal action is taken based on ALPR without the right to question the accuser. How easily can the individual have the right to review in court how a traffic ticket was arrived at by ALPR? • As the technology proliferates, private innocent activity becomes documented in an unprecedented fashion. A security consultant obtained the police records in his California town and found 112 license plate records and accompanying photos including one of him and his daughters simply exiting the vehicle. When a serial shooter was captured in Germany by the use of this technology it was also noted that perhaps 80 million images of innocent activity had to also occur to yield the incriminating evidence. • The retention time and safeguard on use of the data can exacerbate or lessen concerns. One recent study indicated some police departments retain data for five years or longer. Some years ago the chief and other officers in Edmonton, Canada were fired after using an ALPR database to target a newspaper writer critical of the department. If you saw the movie Minority Report you may recall the billboards which reacted to the vehicle ID and tuned advertising content to what was known about the individual. Today the technology for this is now in place. As a result of the above, laws have been passed in the United States to curtail the use of the technology. These include New Hampshire, Maine, Vermont, Maryland, and Utah. These concerns are mentioned to simply indicate there are ethical and even legal boundaries to be observed when planning the use of the technology. Will you be implementing ALPR to secure your operations and people? If your operations have a parking lot or vehicle access you should likely consider ALPR as part of your surveillance technology. Reliable plate image acquisition in single lanes can be added for less than $2,000. Multilane access with accompanying image processing and database matching can also be had for less than the cost of physical gate technology.